So, I just got back from the Hollywood Bowl. 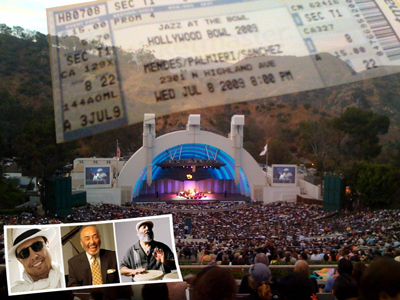 Poncho Sanchez, Eddie Palmieri and Sergio Mendes were performing. AMAZING. I had so much fun. Those of us who live out here in LA need to take advantage of the Hollywood Bowl being in our backyard- it is so wonderful. There was a rapper that performed with Sergio Mendes and his band. I'm not sure if I liked it. I am a huge hip hop fan and some of my favorite performers are hip hop artists (Crown City Rockers, Living Legends, Zion I), but I still think that I would have preferred Sergio without the hip hop addition. It's weird - I'd go see this MC again because he was good, but I think he sort of diluted the latin groove on stage. It's like adding ice cubes to your wine (I've heard of people who do this). Yeah, I guess its refreshing but I'd much rather have my wine without the ice. You be the judge... check out H2O on his myspace.